This topic contains 5 replies, has 2 voices, and was last updated by Alexander Bautz 2 days, 4 hours ago. 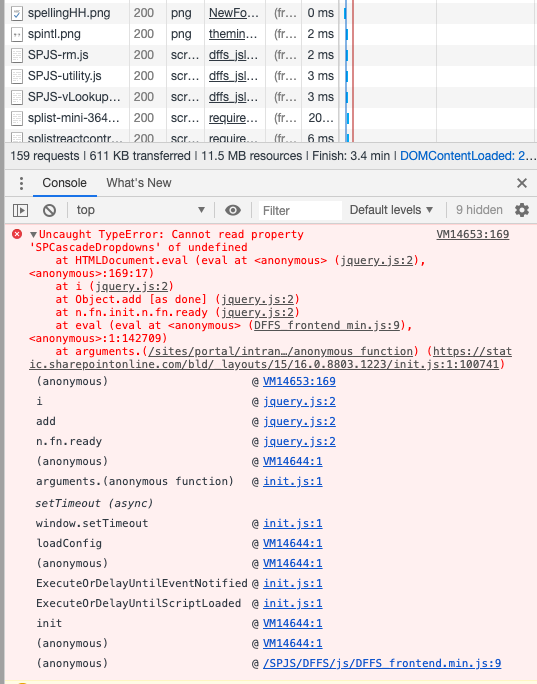 Sounds strange – try bringing up the developer tools and look at the Network tab and see if the spjs-casc.js file is loaded, and if it shows any errors. SPCascadeDropdowns is not referring to my cascading dropwdown, but to SPServices. Please ensure you load this script before you try to access it in Custom JS. Sorry… that was my confusion… this form used to use SPServices Cascade Dropdowns… we would like to switch it to DFFS Cascading dropdowns… so that error is not relevant to this discussion. Fact remains the the loader calls on spjs_casc file and the file is in the plug-in directory, but it does not load. I can give you access if that would help. I see. Please note that the SPServices casc solution uses proper lookup columns, while the spjs-casc uses plain text fields. This means you cannot just switch from SPServices to SPJS-Casc without changing to plain text columns. If you send me login details I’ll look at it later tonight.